(Nanowerk News) German scientists measured for the first time long-lived coordinated magnetic fluctuations in a magnetic material using a new neutron beam technique. One of the most familiar magnetic materials is magnetized iron. Much of the observed behaviour of iron and related magnetic materials can be understood using existing theoretical results. However, due to limitations of the experimental techniques that were previously available, important characteristics of the excited states of such compounds could not be measured. A team of physicists led by Prof. Bernhard Keimer, a director at the Max Planck Institute for Solid State Research in Stuttgart, and researchers from the Technical University of Munich and the Hahn-Meitner Institute, Berlin, have used a recently-implemented, high-resolution neutron technique at the new research reactor FRM II in Munich to perform the first comprehensive, low-temperature measurements of the lifetimes of low-energy excitations in a magnetic material. Their results are published this week in Science magazine ("Spin-Wave Lifetimes Throughout the Brillouin Zone "). These data should help address a longstanding question in the physics of magnetically-ordered materials: how such spin waves interact, and whether their interactions are described well by existing physical models. The properties of magnetic materials such as iron, which are also known as ferromagnets, are familiar to many. The magnetic atoms in such materials possess an internal angular momentum called spin deriving from their electrons. These spins can be considered to act as tiny bar magnets. In a ferromagnet, all of the spins point in the same direction. Once such a material has been exposed to a magnetic field, it behaves as a magnetized object. A closely related class of materials is that of the antiferromagnets, in which half of the spins point in the opposite direction. Consequently, though the same number of magnetic moments is present as in a ferromagnet, these materials do not become magnetized by application of a magnetic field. Numerous examples of antiferromagnets have been synthesized since their discovery over 70 years ago. They have found important technological application, for instance in computer hard disks. MnF2, the material studied by the researchers, is an antiferromagnet. In this ionic material, each Mn2+ ion carries a net spin oriented in the opposite direction from that in which its neighbors point. It is easy to grow large, high-purity crystals of this material with close to perfect structure. As a consequence, its physical properties have been investigated extensively as a model system in solid state physics. Beams of neutrons are particularly useful tools for investigating magnetic materials. Like electrons, neutrons possess spin. If a beam of neutrons is shined on a magnetic material, the neutron spins interact with the spins in the material, just as two small bar magnets interact. The neutrons that interact are then deflected; analysis of the deflected beam provides insight into the magnetic properties of the material. 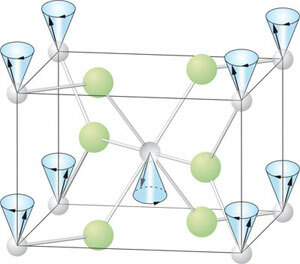 Further, since neutrons are only weakly absorbed by most materials, they generally penetrate deeply into a given sample, so the technique can be used to gain information about bulk physical properties. In many antiferromagnets, including MnF2, the spins of the magnetic atoms interact strongly with each other. In such a case, if a small amount of energy is added to the system, the energy is not absorbed by a single ion, but instead becomes distributed over a large volume of the material. The corresponding excitation is termed a spin wave; it can be thought of as a coordinated magnetic fluctuation. To visualize this phenomenon, we can consider one end of each bar magnet to be fixed at the vertex of a cone, and imagine that the other precesses in a periodic fashion around the mouth of the cone. The allusion to a water wave becomes clear if we think of a given point on the water surface: the water level bobs up and down in a periodic fashion. In the case of the spins, no spatial movement is involved. If we consider a given direction in the crystal, a snapshot picture of the mouths of the cones would reveal each bar magnet to be rotated progressively farther around its cone axis than its nearest neighbor. As time progresses, this pattern propagates through the crystal, in analogy to the travel of a water wave. The energy spectrum of such spin waves can be described to great accuracy in many systems by existing theory. A spin wave moves through a solid until its travel is interrupted by, for example, another spin wave, or an atomic-scale impurity or defect in the crystal. As a result of such a collision, the energy and momentum of the spin wave will in general change. The lifetime of the spin wave is the average length of time the spin wave exists before suffering this fate. Correspondingly, measurement of the spin-wave lifetime provides a window into the nature and strength of the interactions the spin waves experience. Numerous theoretical calculations of the spin-wave lifetime have been performed over the last 40 years, with particular attention paid to the question of collision with other spin waves. To date, such predictions could not be tested experimentally, since techniques capable of measuring long enough lifetimes over a range of spin-wave momenta were unavailable. Thus, the fundamental question of how such spin waves interact, and whether their interactions are described well by existing physical models, has yet to be answered. The Max-Planck team introduced a new "spin echo" technique in which a magnetic field is used to label the neutrons that strike the sample. The neutron spins in the incident beam are made to precess around the magnetic field in such a manner that the extent of the precession depends on the neutron energy. After giving up energy to the sample, the neutrons pass through a second magnetic field pointed in the opposite direction to the first, with the result that each individual neutron scattered by the sample unwinds the precession it experienced in the first magnetic field. The net precession which remains yields, after analysis, the spin-wave lifetime. The researchers utilised the "neutron resonance spin-echo triple-axis spectrometry" (NRSE-TAS) technique to measure spin-wave lifetimes in MnF2, using their recently-finished neutron spectrometer TRISP at the FRM-II research reactor in Garching, Germany. They discovered two unexpected dips in the spin-wave lifetime: one for small spin-wave momenta over a range of temperatures, and another at large momenta, the depth of which increases with increasing temperature. Explanation of these minima constitutes a challenge to existing spin-wave theory; the high resolution and broad range of the data in temperature and momentum permit more extensive comparison with the theory than was previously possible. Once the applicability of such existing theoretical predictions has been evaluated, it should be possible to interpret future studies of more complex magnetic materials. For the present, the researchers have demonstrated the potential of their spin echo technique for addressing fundamental questions in the physics of magnetic materials.